The WATCH ACADEMY aims to teach the practical and theoretical aspects of the art of watchmaking. The WATCH ACADEMY provides you with a unique glimpse behind the scenes of watchmaking. You’ll learn first-hand about watch mechanics, discover what makes a timepiece tick and enjoy a special experience that will remain with you forever. Individual topics are offered in separate modules, some of which follow on consecutively. Clients can choose from a wide range of options to suit their individual needs and put together a programme for a unique event. Boris Kuijper learned what is widely considered to be a typically Swiss profession, that of a watchmaker and repairer. After a four-year apprenticeship he moved from Eastern Switzerland to Lucerne in Central Switzerland in 1988. Working at BUCHERER headquarters, he was able to consolidate and build on what he had already learned. The complex overhaul and restoration of various top-quality watch brands, such as ROLEX, PIAGET, IWC and AUDEMARS PIGUET, were part of his daily routine. Kuijper has always had a secret calling: namely, to pass on his profound and wide-ranging watchmaking expertise to others. In 1992, he set up a trainee workshop at BUCHERER headquarters with room for eight apprentices. It was a statement of his refusal to accept the extinction of a fine, traditional craft. At the same time, he built on his own technical expertise and obtained a federally recognized qualification as a master watchmaker. In 1994 he started a new job at GÜBELIN in Lucerne. In this position, he focused on the overhaul and restoration of PATEK PHILIPPE watches. At the same time, he was put in charge of reorganizing and modernizing the watchmaking workshops at the company’s head office. In 1995, BUCHERER succeeded in luring him back. For 12 years, Kuijper was responsible for customer service and the company’s international network of authorized dealers. His main task was the overall management of the workshops at head office and at individual points of sale. 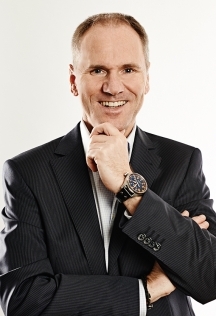 In order to meet the demands of this new challenge, Kuijper continued his education at various business institutes, where he obtained qualifications as a sales manager and a Master’s degree in service marketing and management from the business school at Lucerne University of Applied Sciences and Arts. Kuijper has been an instructor for the Swiss Association for General Entrepreneurs (VSGU) since 2006. Here, he passes on his extensive knowledge of watchmaking and customer service to retail trainees. His focus has always been on customers’ needs and concerns. In 2007, Boris Kuijper took on the challenge of managing and developing the international service department for another watch manufacturing company, IWC SCHAFFHAUSEN. Over a period of five years, he drew on a wealth of innovation to restructure IWC SCHAFFHAUSEN’s customer service and helped it to position itself successfully in the market since then. Kuijper’s career has now come full circle. In 2012 he returned to his roots in the art of watchmaking. His love of the craft and the realization of his childhood vision were clear priorities. On 30 March 2012, the foundations were laid for a company that brings people closer to the art of watchmaking and inspires them in new and different ways – the WA – WATCH ACADEMY GmbH.